This interesting yet easy sourdough bread recipe says hello! to hearty bread baking season while waving goodbye to two iconic flavors of summer. Chopped fresh tomatoes take the place of most of the water, and the whole wheat flour adds flavor and depth. If you have a sourdough starter living in your fridge, this is a fun way to use it. I created my starter years ago using the simple directions in one of my favorite bread books, Bread Alone: Bold Fresh Loaves from Your Own Hands, written by my bread baking hero, Daniel Leader. Daniel's second book, Local Breads: Sourdough and Whole-Grain Recipes from Europe's Best Artisan Bakers is wonderful, too—and includes several authentic European sourdough starter recipes. Part travelogue, part bread making class, and part gastronomic history lesson, it's the culmination of dozens of trips to Europe over the past two decades in search of bakers who are still using time-honored methods and ingredients to create loaves unique to their towns and cities. Warning: these books all make you want to bake bread! Not up for starting sourdough just yet? My simple homemade pizza dough recipe is a great place to start with yeast, and my Farmhouse White is an easy sandwich bread recipe that's pefect for beginners. You might also enjoy my Ten Tips on How To Bake Better Artisan Breads at Home, which includes several other bread books I really like. 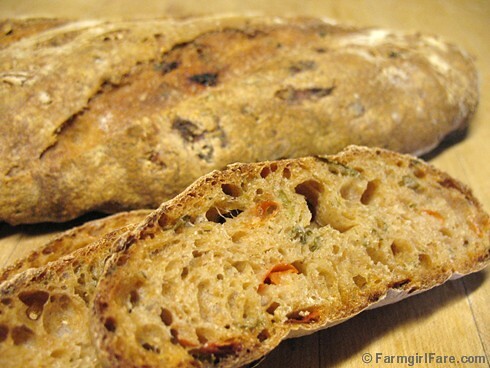 And you'll find more of my favorite bread recipes in the Farmgirl Fare Recipe Index. Do have any favorite novels that feature bread or baking? © FarmgirlFare.com, where freshly baked bread never goes out of season—and I'd better get back to baking tonight's loaves. I haven't read any novels that feature baking or bread. I just looked at "Bread Alone" on Amazon, sounds like a really good read! My favorite bread book is "Great Whole Grain Breads" by Beatrice Ojakangas. A LOT of my bread recipes for the Farmer's Market started from recipes in her book. I love the smell of fresh bread and that sourdough looks heavenly. I cheat and use a bread machine. Not the same but still good. I luv the smell of bread baking.